The MUM1 symbol is polysemous; although it is an older synonym for IRF4 (HGNC:6119), it is also the current HGNC official symbol for melanoma associated antigen (mutated) 1 (HGNC:29641; located at 19p13.3). In melanocytic cells the IRF4 gene may be regulated by MITF. 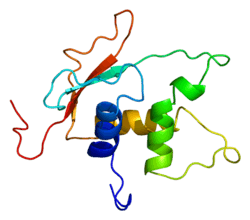 IRF4 is a transcription factor that has been implicated in acute leukemia. This gene is strongly associated with pigmentation: sensitivity of skin to sun exposure, freckles, blue eyes, and brown hair color. A variant has been implicated in greying of hair. ↑ "Diseases that are genetically associated with IRF4 view/edit references on wikidata". ↑ Grossman A, Mittrücker HW, Nicholl J, Suzuki A, Chung S, Antonio L, Suggs S, Sutherland GR, Siderovski DP, Mak TW (Feb 1997). "Cloning of human lymphocyte-specific interferon regulatory factor (hLSIRF/hIRF4) and mapping of the gene to 6p23-p25". Genomics. 37 (2): 229–33. doi:10.1006/geno.1996.0547. PMID 8921401. ↑ Xu D, Zhao L, Del Valle L, Miklossy J, Zhang L (Jun 2008). "Interferon regulatory factor 4 is involved in Epstein-Barr virus-mediated transformation of human B lymphocytes". J Virol. 82 (13): 6251–8. doi:10.1128/JVI.00163-08. PMC 2447047 . PMID 18417578. ↑ "Entrez Gene: IRF4 interferon regulatory factor 4". ↑ Hoek KS, Schlegel NC, Eichhoff OM, Widmer DS, Praetorius C, Einarsson SO, et al. (2008). "Novel MITF targets identified using a two-step DNA microarray strategy". Pigment Cell Melanoma Res. 21 (6): 665–76. doi:10.1111/j.1755-148X.2008.00505.x. PMID 19067971. ↑ Adamaki M, Lambrou GI, Athanasiadou A, Tzanoudaki M, Vlahopoulos S, Moschovi M (2013). "Implication of IRF4 aberrant gene expression in the acute leukemias of childhood". PLoS ONE. 8 (8): e72326. doi:10.1371/journal.pone.0072326. PMC 3744475 . PMID 23977280. ↑ Praetorius C, Grill C, Stacey SN, Metcalf AM, Gorkin DU, Robinson KC, et al. (November 2013). "A Polymorphism in IRF4 Affects Human Pigmentation through a Tyrosinase-Dependent MITF/TFAP2A Pathway". Cell. 155 (5): 1022–33. doi:10.1016/j.cell.2013.10.022. PMID 24267888. ↑ Adhikari K, Fontanil T, Cal S, Mendoza-Revilla J, Fuentes-Guajardo M, Chacón-Duque JC, et al. (2016). "A genome-wide association scan in admixed Latin Americans identifies loci influencing facial and scalp hair features". Nature Communications. 7: 10815. doi:10.1038/ncomms10815. PMC 4773514 . PMID 26926045. Lay summary – BBC News. 1 2 Gupta S, Jiang M, Anthony A, Pernis AB (December 1999). "Lineage-specific modulation of interleukin 4 signaling by interferon regulatory factor 4". J. Exp. Med. 190 (12): 1837–48. doi:10.1084/jem.190.12.1837. PMC 2195723 . PMID 10601358. ↑ Rengarajan J, Mowen KA, McBride KD, Smith ED, Singh H, Glimcher LH (April 2002). "Interferon regulatory factor 4 (IRF4) interacts with NFATc2 to modulate interleukin 4 gene expression". J. Exp. Med. 195 (8): 1003–12. doi:10.1084/jem.20011128. PMC 2193700 . PMID 11956291. ↑ Brass AL, Zhu AQ, Singh H (February 1999). "Assembly requirements of PU.1-Pip (IRF-4) activator complexes: inhibiting function in vivo using fused dimers". EMBO J. 18 (4): 977–91. doi:10.1093/emboj/18.4.977. PMC 1171190 . PMID 10022840. ↑ Escalante CR, Shen L, Escalante MC, Brass AL, Edwards TA, Singh H, Aggarwal AK (July 2002). "Crystallization and characterization of PU.1/IRF-4/DNA ternary complex". J. Struct. Biol. 139 (1): 55–9. doi:10.1016/S1047-8477(02)00514-2. PMID 12372320. Mamane Y, Sharma S, Grandvaux N, Hernandez E, Hiscott J (2002). "IRF-4 activities in HTLV-I-induced T cell leukemogenesis". J. Interferon Cytokine Res. 22 (1): 135–43. doi:10.1089/107999002753452746. PMID 11846984. Yamagata T, Nishida J, Tanaka S, Sakai R, Mitani K, Yoshida M, Taniguchi T, Yazaki Y, Hirai H (1996). "A novel interferon regulatory factor family transcription factor, ICSAT/Pip/LSIRF, that negatively regulates the activity of interferon-regulated genes". Mol. Cell. Biol. 16 (4): 1283–94. PMC 231112 . PMID 8657101. Iida S, Rao PH, Butler M, Corradini P, Boccadoro M, Klein B, Chaganti RS, Dalla-Favera R (1997). "Deregulation of MUM1/IRF4 by chromosomal translocation in multiple myeloma". Nat. Genet. 17 (2): 226–30. doi:10.1038/ng1097-226. PMID 9326949. Brass AL, Zhu AQ, Singh H (1999). "Assembly requirements of PU.1-Pip (IRF-4) activator complexes: inhibiting function in vivo using fused dimers". EMBO J. 18 (4): 977–91. doi:10.1093/emboj/18.4.977. PMC 1171190 . PMID 10022840. Rao S, Matsumura A, Yoon J, Simon MC (1999). "SPI-B activates transcription via a unique proline, serine, and threonine domain and exhibits DNA binding affinity differences from PU.1". J. Biol. Chem. 274 (16): 11115–24. doi:10.1074/jbc.274.16.11115. PMID 10196196. Marecki S, Atchison ML, Fenton MJ (1999). "Differential expression and distinct functions of IFN regulatory factor 4 and IFN consensus sequence binding protein in macrophages". J. Immunol. 163 (5): 2713–22. PMID 10453013. Gupta S, Jiang M, Anthony A, Pernis AB (2000). "Lineage-specific modulation of interleukin 4 signaling by interferon regulatory factor 4". J. Exp. Med. 190 (12): 1837–48. doi:10.1084/jem.190.12.1837. PMC 2195723 . PMID 10601358. Mamane Y, Sharma S, Petropoulos L, Lin R, Hiscott J (2000). "Posttranslational regulation of IRF-4 activity by the immunophilin FKBP52". Immunity. 12 (2): 129–40. doi:10.1016/S1074-7613(00)80166-1. PMID 10714679. Gupta S, Anthony A, Pernis AB (2001). "Stage-specific modulation of IFN-regulatory factor 4 function by Krüppel-type zinc finger proteins". J. Immunol. 166 (10): 6104–11. doi:10.4049/jimmunol.166.10.6104. PMID 11342629. Imaizumi Y, Kohno T, Yamada Y, Ikeda S, Tanaka Y, Tomonaga M, Matsuyama T (2002). "Possible involvement of interferon regulatory factor 4 (IRF4) in a clinical subtype of adult T-cell leukemia". Jpn. J. Cancer Res. 92 (12): 1284–92. doi:10.1111/j.1349-7006.2001.tb02151.x. PMID 11749693. Rengarajan J, Mowen KA, McBride KD, Smith ED, Singh H, Glimcher LH (2002). "Interferon regulatory factor 4 (IRF4) interacts with NFATc2 to modulate interleukin 4 gene expression". J. Exp. Med. 195 (8): 1003–12. doi:10.1084/jem.20011128. PMC 2193700 . PMID 11956291. Sharma S, Grandvaux N, Mamane Y, Genin P, Azimi N, Waldmann T, Hiscott J (2002). "Regulation of IFN regulatory factor 4 expression in human T cell leukemia virus-I-transformed T cells". J. Immunol. 169 (6): 3120–30. doi:10.4049/jimmunol.169.6.3120. PMID 12218129. Escalante CR, Shen L, Escalante MC, Brass AL, Edwards TA, Singh H, Aggarwal AK (2003). "Crystallization and characterization of PU.1/IRF-4/DNA ternary complex". J. Struct. Biol. 139 (1): 55–9. doi:10.1016/S1047-8477(02)00514-2. PMID 12372320. Hu CM, Jang SY, Fanzo JC, Pernis AB (2003). "Modulation of T cell cytokine production by interferon regulatory factor-4". J. Biol. Chem. 277 (51): 49238–46. doi:10.1074/jbc.M205895200. PMID 12374808. Fanzo JC, Hu CM, Jang SY, Pernis AB (2003). "Regulation of lymphocyte apoptosis by interferon regulatory factor 4 (IRF-4)". J. Exp. Med. 197 (3): 303–14. doi:10.1084/jem.20020717. PMC 2193834 . PMID 12566414. O'Reilly D, Quinn CM, El-Shanawany T, Gordon S, Greaves DR (2003). "Multiple Ets factors and interferon regulatory factor-4 modulate CD68 expression in a cell type-specific manner". J. Biol. Chem. 278 (24): 21909–19. doi:10.1074/jbc.M212150200. PMID 12676954. Sundram U, Harvell JD, Rouse RV, Natkunam Y (2004). "Expression of the B-cell proliferation marker MUM1 by melanocytic lesions and comparison with S100, gp100 (HMB45), and MelanA". Mod. Pathol. 16 (8): 802–10. doi:10.1097/01.MP.0000081726.49886.CF. PMID 12920225.